HDMI, stands for the rather scary-sounding High Definition Multimedia Interface. HDMI is a connector that allows you to connect a piece of high-definition equipment, such as a Sky+HD box or a Blu-Ray player to an HD-Ready TV set. To the right is a picture of an HDMI plug. TV sets and set-top boxes that support High Definition commonly have a ‘female’ HDMI socket, and you use a male-to-male HDMI lead to connect the two. Where do I get an HDMI lead? You can buy an HDMI lead in lengths running from 0.5 metres to 50 metres. Different quality cables are available – prices range from a few pounds to several hundred pounds. It’s important to be aware that if you use a very long HDMI lead, you may start getting signs of interference (white sparkles on screen). Leads over 10 metres are prone to picking up interference from mains electricity, so if you need to go over 10 metres, use a high-quality cable that’s well shielded. Not enough HDMI sockets on your TV? If your TV doesn’t have enough SCART sockets, consider an HDMI Switch. Need to connect one HD box to two TV sets? If you need to split one HDMI feed to multiple TV sets, you will need an HDMI splitter. These require mains power. Q. Can I connect a USB memory stick to my TV using HDMI? A. Well – no, not directly. You could consider a rather neat little solution though – the WD TV Media Player from Western Digital. A low-priced way of watching HD video from a USB device. See our review of the WD TV Media Player. I AM UNABLE TO PLAY MY ACER LAPTOP THRU MY FERGUSON TV USING AN HDMI LEAD. I HAVE USED THE LEAD ON MY GIRLFRIENDS SAMSUNG TV AND IT WAS PERFECT. I HAVE TRIED THE SETTINGS ON LAPTOP SETTING IT TO PLAY THRU TV SHOWING BOTH SCREENS, HOWEVER THIS MAY NOT BE THRU HDMI. IF YOU CAN HELP APPRECIATED. Which is better to use? HDMI or VGA cable? I’ve bought a HDMI splitter and connected my sky to ain’t he tv via the splitter through a 5m HDMI a HDMI coupler then through a 10m HDMI .. Perfect view but not sound.? 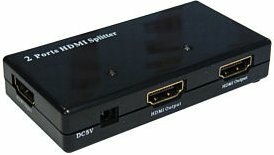 Can we use HDMI box with normal cable connection ?Is it helpful in getting a high picture quality..?